The chicken right out of the oven. The chicken breast was tender and juicy, and the feta gave each mouthful a pleasant salty flavour. The kale was soft and the sundried tomato pesto fresh and tangy. The combination of ingredients was as close to perfect as it gets, if I may say so myself! The best part is that I have lots of it left over. I am sooo excited for my lunch tomorrow! 2. Wash the kale and pat it dry. Chop the leaves into 1/2-inch thick pieces, then place in a microwaveable bowl, cover with a plate, and steam briefly, only 30 seconds to 1 minute, to wilt them a bit. This will help when you mix it with the other stuffing ingredients. 3. Crumble the feta cheese into small pieces and add to the kale. Stir in the sundried tomato pesto until the mixture is uniform. 4. Cut open the chicken breast lengthwise, keeping one side attached (if you were to open up your chicken, it would look like a butterfly). Spoon the kale mixture into the crease and fold the top of the breast over the filling. You may need to use your hands to get all of the kale into the breast. If you do, make sure you wash your hands thoroughly before touching anything else. 5. 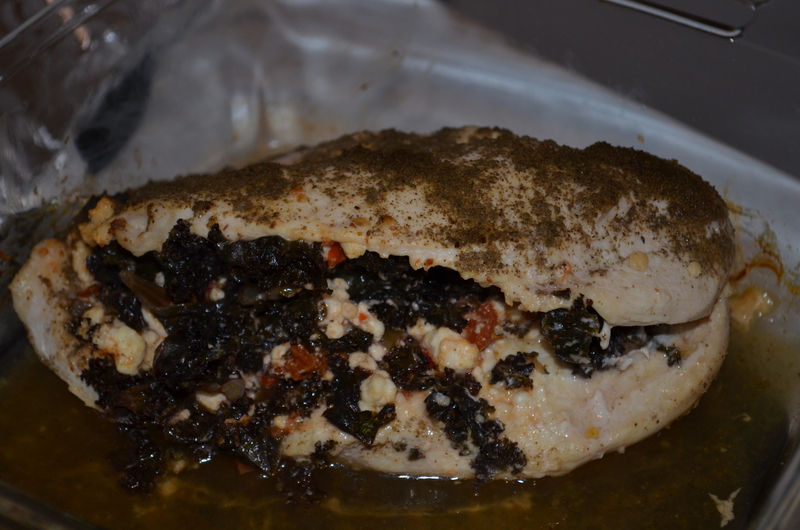 Place the stuffed chicken breast in an oven-proof dish (I used a square glass pyrex dish) and sprinkle with poultry seasoning and fresh black pepper. Cover the dish with foil. Bake until the chicken is cooked through, 30-45 minutes. Serve with your choice of sides: rice, a side salad, potatoes, crusty bread, or steamed vegetables… the options are endless! 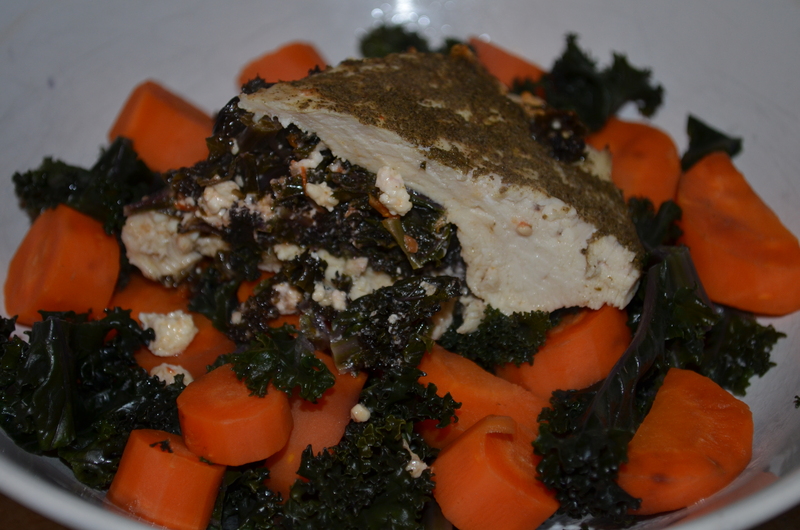 Stuffed chicken over a bed of steamed carrots and kale. Deeeelicious! This entry was posted in Chicken, Entrées, Greens and tagged chicken, family dinner, feta, kale, leafy greens, pesto, stuffed chicken breast, sundried tomatoes by laratboulos. Bookmark the permalink.